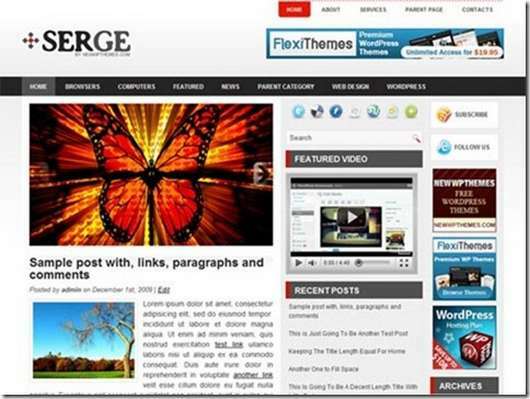 Serge is one of the most popular free Premium WordPress themes. This is a free theme with featured content option and it supports the post thumbnails. The factor that makes this theme one of the best is that, it is suitable for any niche.This means that, it does not matter what you are blogging about, the theme will go hand in hand with your content and pictures. Moreover, it comes with various options at the admin’s panel. This makes it easier and very fast to place or change it to the options that you like. Serge Free Premium WordPress theme has a lot of features that makes it the best. Moreover, it has a fantastic color options and it is attractable to anyone. Below are features that make this theme the best. It has an Easy to use options page: this way, your readers will not have a hard time to browse through your contents. It has 125x125 banners. These banners are easily editable from the admin options. This theme is Widgets Ready: therefore, if you like using certain widgets, then this theme is for you. This theme is SEO friendly andoptimized: it helps your website in ranking and other SEO options. Fixed width: the theme has a fixed width, which makes it attractable and lovely. Moreover, it makes it look official. 1. The free version: the free version is the best for bloggers who only want to express their mind and exercise their freedom of speech. This version is free. 2. The standard version: this version is the best for personal projects only. You can use it in your website and try to make the most out of it. This version is bought at an affordable fee. The cost is $29.95 and it is a one-time fee. 3. The developer version: this version is the best for client’s projects and personal projects as well. Through this version, you will get everything. Moreover, it offers services that you cannot get from other versions. The cost for this version is $49.95 and the cost is a one-time fee. I like it when developer released his theme with few versions (free and premium). In that way, I usually download the free version. Try it out (of course it'll be limited functionality). When I'm satisfied and want more, I can simply upgrade/purchase the premium. By this way, I never had to ask for refund if I found the theme doesn't suit my need.